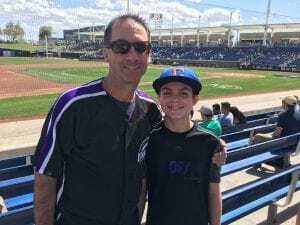 Scott Sarkisian with son Andrew at Rockies spring training. Sarkisian hopes his participation in a trial at UCHealth will lead to relief of longstanding irritation in his upper esophagus. About five years ago, Scott Sarkisian began feeling a lump in his throat. He wasn’t binge-watching sad movies or dwelling on emotional experiences. The lump was a constant, annoying presence that he couldn’t dislodge, no matter how frequently he swallowed or tried to clear his throat. He also developed a chronic cough that frequently developed into a spasm. The symptoms stubbornly persisted and proved to be more than a minor irritation for Sarkisian, now 54. He’s an estimator and salesman for a Denver-area company that restores homes and businesses damaged by fires, floods and the like. That requires meeting with people to discuss costs and plans. The problem also produced frustration. Sarkisian says he bounced from physician to physician looking for answers. No examinations or tests proved conclusive – including a lung scan – but Sarkisian says his providers generally agreed that something was causing acid to enter and irritate the upper part of his esophagus and throat. They prescribed proton pump inhibitors (PPIs), medications designed to treat the condition, broadly known as laryngopharyngeal reflux. The medications – popularly known by brand names like Prilosec and Nexium – are among the most widely prescribed in the world and have for about two decades generally achieved good results for people battling reflux. Scott Sarkisian has taken them for five years. The problem is, they never solved his persistent lump and cough. UCHealth gastroenterologist Dr. Rena Yadlapati, who leads the UCHealth trial, wants to develop a better understanding of esophageal reflux problems. Still looking for answers, Sarkisian participated in a trial now underway at UCHealth University of Colorado Hospital on the Anschutz Medical Campus led by gastroenterologist Dr. Rena Yadlapati. The study aims to find new and more efficient ways to treat varieties of esophageal problems. These include both laryngopharyngeal reflux and gastroesophageal reflux disease (GERD), which Yadlapati says accounts for about 70 percent of the cases she sees in the UCHealth Digestive Health Center. “GERD is incredibly common, but we don’t have a good handle on diagnosing and treating it, especially when there are more complicated esophageal issues,” Yadlapati said. The study also aims to increase understanding of PPIs, which have come under increased scrutiny in recent years for their suspected links to a wide range of problems, including dementia, bone fractures, vitamin deficiencies, and diarrhea. Yadlapati is not a PPI opponent; she co-authored a paper criticizing calls to alter PPI use without evidence to support it. She does, however, want to treat patients’ esophageal problems with more care than simply writing PPI prescriptions automatically or indefinitely. The trial involves a variety of tests. Each participant receives a baseline salivary test to measure pepsin, a stomach enzyme that may be a marker of reflux; a manometry test that measures the strength of the lower esophagus; and an esophageal pH test that measures the amount of acid entering the esophagus from the stomach. The study proceeds in two four-week phases. In the first phase, participants receive a regimen of PPIs. In the second, they continue to take PPIs but also receive a device called a Reflux Band (formerly known as a Reza Band) to wear each night. The Reza Band fastens around a patient’s neck just below the Adam’s apple and applies controlled pressure to prevent reflux of stomach acid through the upper part of the esophagus. The FDA approved the device for marketing in 2015 after a small trial produced promising results and for over-the-counter sales in 2018. After eight weeks, the study participants again take the salivary test to see what improvement, if any, was made and to consider other treatment options, if necessary. The trial is also enrolling a group of patients who have not had any esophageal problems or taken PPIs. The idea is to create a database of “normal” measurements for the tests to compare with those of the patients with esophageal issues, said Zoe Van De Voorde, professional research assistant with the Division of Gastroenterology in the Department of Medicine at the University of Colorado School of Medicine. There has been little or no research on what a “normal” upper esophagus looks like, how it moves, or its exposure to stomach acid, Van De Voorde explained. “In terms of these data points, healthy volunteers are very important for us to establish what is truly significant in terms of GERD, and how a normal patient differs from one experiencing symptoms,” Van De Voorde said. She also noted that data gathered from these patients will be available for other researchers to use as control values for their studies. 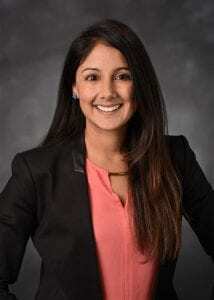 Yadlapati said she views the trial as especially important because an estimated 10 percent to 40 percent of GERD patients don’t get symptom relief or improved quality of life from a standard four- to eight-week PPI regimen. “We want to help find alternatives,” she said. For example, some patients might benefit from a surgery that wraps a portion of the stomach around the lower part of the esophagus to seal off the acid reflux route, a solution Yadlapati said has achieved excellent results but has risks of complications. An alternative to surgery and prolonged medication use is helping patients make lifestyle changes to lose weight. Extra pounds put pressure on the abdomen, in effect forcing acid upward from the stomach, Yadlapati said. Weight loss isn’t an issue for Scott Sarkisian. But after taking an increased dose of PPIs and wearing the Reza Band as part of the trial, the lump in his throat stubbornly remained. In late October, Dr. Yadlapati’s team cauterized a patch of gastric tissue in his upper esophagus that she suspected might be the source of the problem. He’s hopeful for a positive result. Yadlapati stressed that Sarkisian’s outpatient procedure wasn’t a part of the study. But his participation in it points to the importance of individualizing each case. “We’re trying to move to precision, personalized medicine, and to understand what is happening with each patient,” she said. For more information about the trial, contact Zoe Van De Voorde at 303-724-9228 or zoe.vandevoorde@ucdenver.edu. Tyler Smith is a freelance writer based in metro Denver.